The Manhattan is a classic cocktail dating back to the late 1800s. It is said that the cocktail, originally made with rye whiskey, was served at a party by Jenny Churchill, Winston’s mama. The drink was wildly popular in the late 50s and is still served commonly today. Now, that is what I call staying power! The traditional manhattan is composed of rye whiskey, dry or sweet vermouth and bitters. It is usually garnished with a Maraschino cherry and/or a twist of orange or lemon. Lemon if using dry vermouth, orange if using sweet. As you can see, there are no real mixers mentioned. I appreciate that many people, my own mama included, can enjoy the punch that is involved with sipping straight whiskey… I however, am not that girl! I like my cocktails to effervesce and a little sweetness is ok too! Beware! This beverage is a doozy! Even my modified version is no joke! The reason I’m making this is because I am DYING to share these cherries with you! I try to stay a bit pedestrian with ingredients because I want my recipes to be made. I don’t want to be the gal who is suggesting you make a dinner for four with $137 dollars worth of ingredients. That being said, sometimes you have to splurge and this beautiful jar of black cherries in syrup is one of those times! 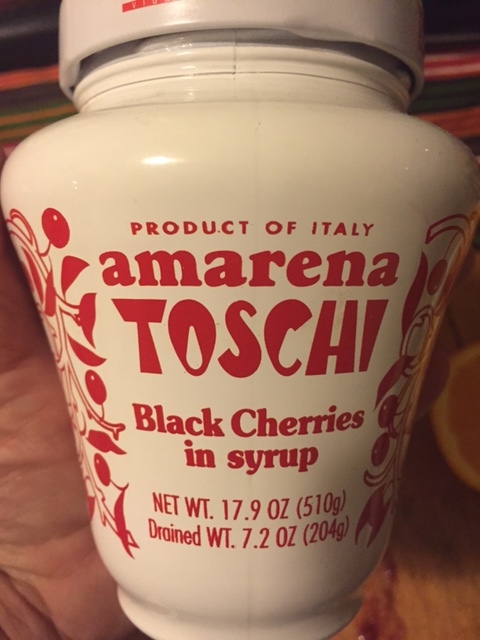 They are called Amarena Toschi and are Italian made with the most beautiful sour black cherries in a wonderfully rich syrup. The jar should last a dozen or so cocktails and is a bit spendy at around $14 per jar. Worth. Every. Penny. Whiskey or Bourbon. Not surprisingly, I used Maker’s Mark because it’s my fav! Maraschino cherries. If the variety I’ve shared above is unavailable or too pricey, using regular Maraschino cherries is a completely acceptable substitution. Add 3oz bourbon, 1oz Sweet Vermouth and a couple dashes bitters into a shaker filled with ice. Shake briskly and pour evenly into two ice filled rocks glasses. Spoon about 1 Tbsp (2 if you prefer a sweeter cocktail) of the cherry syrup into each glass and top with club soda. 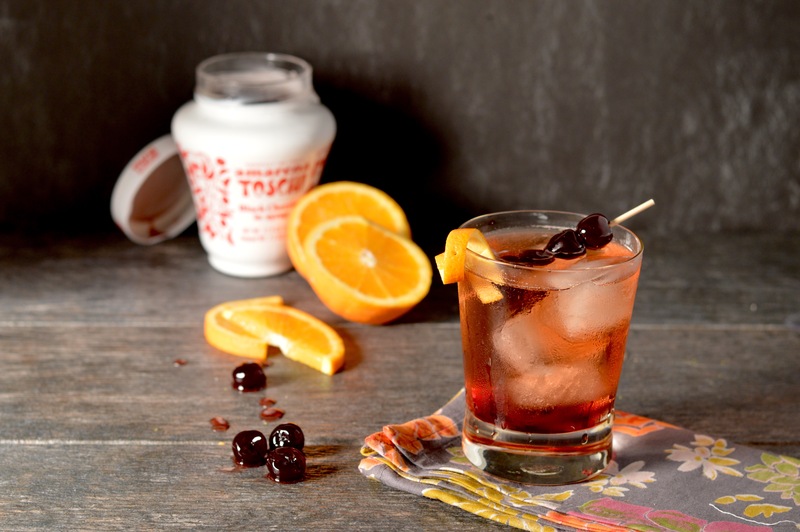 Give a quick stir and garnish with a few cherries and an orange peel. I hope you enjoy this bevy and trust me when I warn you… a little goes a long way! Keep those Uber and Lyft apps updated, yo! Previous Post Bikram Yoga and trying not to die.